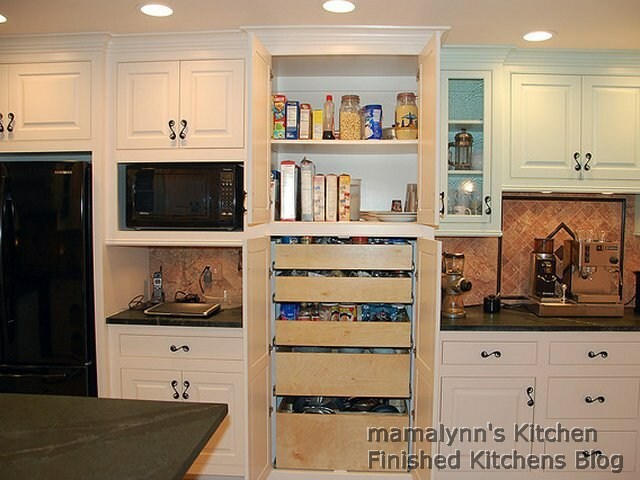 Cabinets: locally made, beaded inset doors. 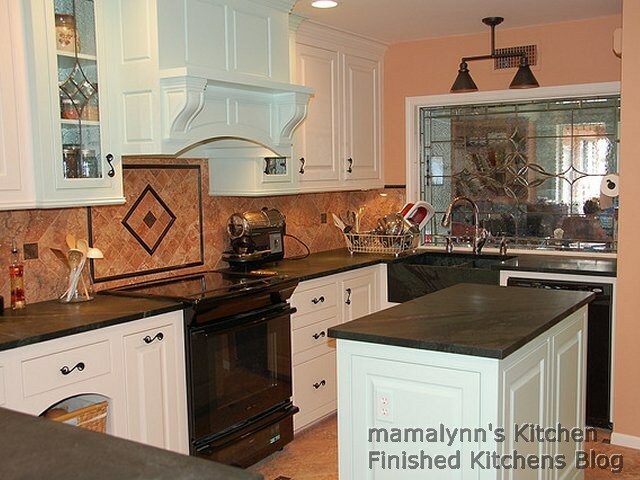 The glass in the cabinets is antiqued. Backsplash: Daltile Canaletto Rosso with Dakota Mahogany inserts. (The ceramic tile always looks a bit orange in the pictures when it is actually a terracotta color. Dishwasher - Whirlpool that I got a year ago to replace my worn out one. It’s quiet, works great, and I saw no need to change it. Refrigerator - Samsung 26 Cu Ft. 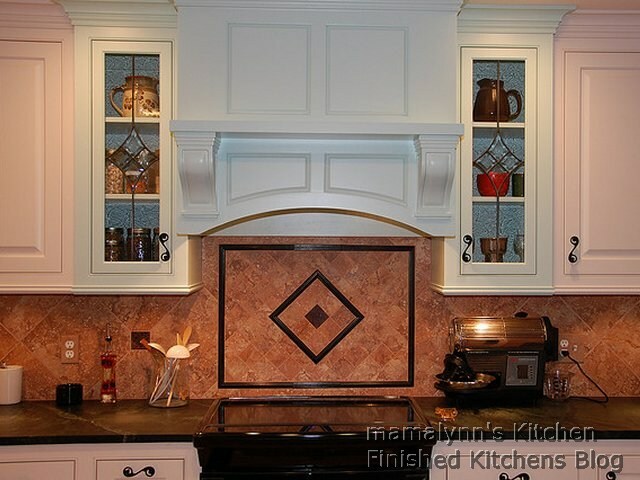 Range hood - custom built, Modernaire liner. Over the sink - The Piedmont in antique black from Schoolhouse Electric. Over the table - Hinkley Juliette 3 Light Mini Chandelier in Olde Black. Floor: Daltile Canaletto Rosso with Dakota Mahogany inserts. Paint: All Behr colors. Some of them we did tweak a bit. 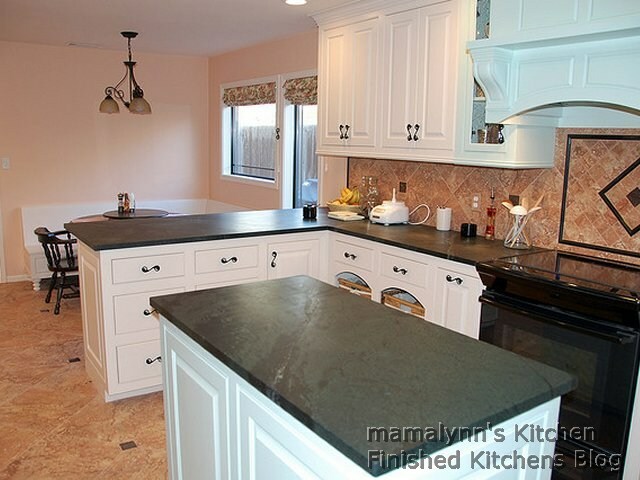 Green cabinets: We started with Behr Mint Fizz, but there was not enough contrast, so we darkened it. 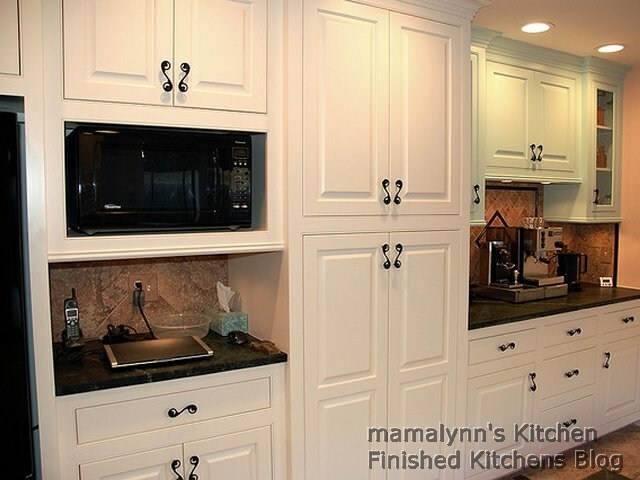 Cream cabinets, banquette, and all baseboards, trim, doors: Behr China Cup. Shades: from Fabric Workroom online. 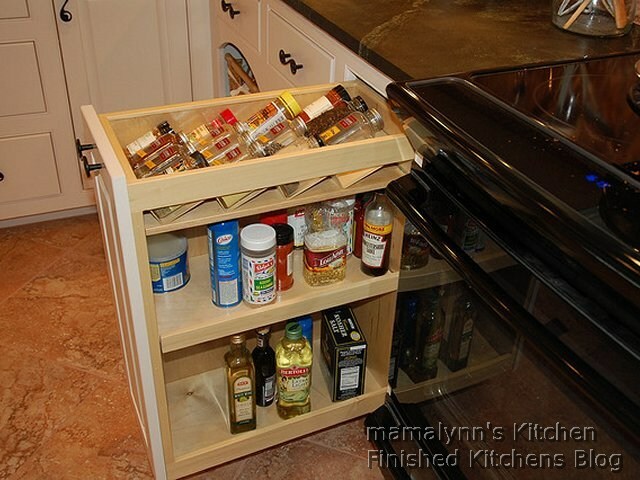 The cleats are by ChicCleats and mimic the scroll of the cabinet pulls. Two door interiors painted with magnetic paint (3 coats) and then with chalkboard paint. We bought our house new in 1981. In 1989 I closed in the deck to create a room for me. 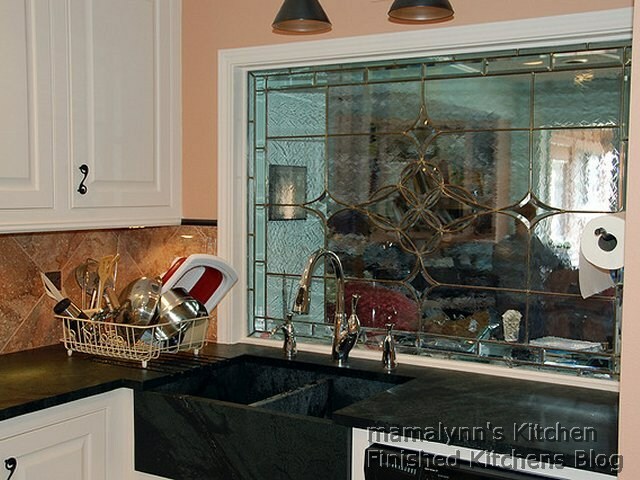 The kitchen window over the sink that looked out onto the deck became a leaded glass window looking into my room. 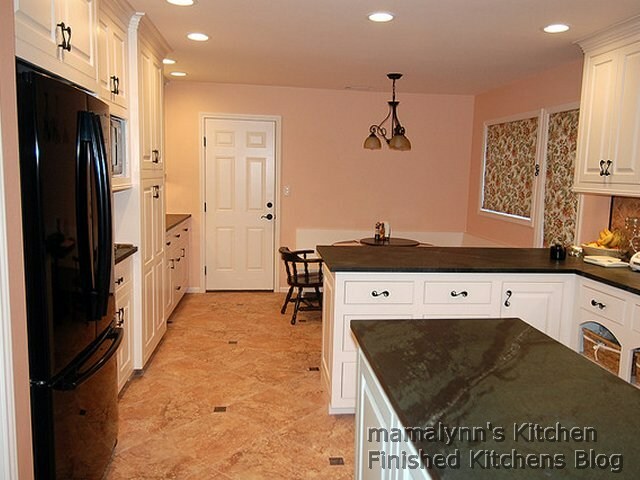 At that time I had the upper cabinet doors removed and those cabinets painted and I changed the wallpaper and the vinyl floor as the old floor had not held up well. Nothing has been done to the kitchen since then except for the occasional new appliance as an old one died. None of this was DIY - neither of us has any talent in that direction. Since I built in the banquette, I was able to move the peninsula out by about a foot which allowed me to make the island a little longer. Originally the peninsula had what I assume was meant to be a breakfast bar, but it was much too narrow to be used. I had that cut down to make one large area and the overhang now extends out a bit more. The only extra space I was able to add to the kitchen is at the coffee bar. The space for the frig already extended into the utility room and the space that had the oven and the pantry extended into the garage. I extended the rest of that wall into the garage by the same amount, roughly 6.5 ft x 2.5 ft. That gave me room for a slightly large pantry and for the coffee bar. This is really beautiful. I love what you've done!